Fair warning- this post will contain far too many photos. I seriously could not decide which ones I wanted to include. And believe or not, I actually cut some from the pile. Remember that I said this once you've made your way to the bottom. Hmmm. Perhaps I could just put one sentence between each picture. Make it seem like there's not too many. We'll see how it goes. Let's start off by talking about marshmallows. Not just marshmallows. Homemade marshmallows. Not just homemade marshmallows. Homemade chocolate marshmallows. Not just homemade chocolate marshmallows. 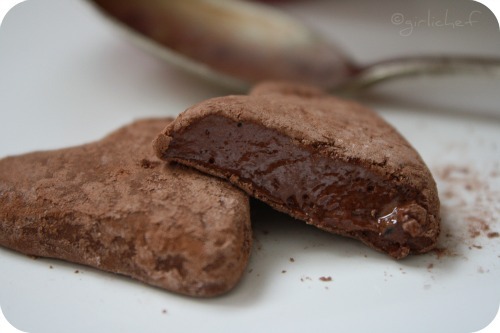 Homemade chocolate marshmallows shaped like hearts. Not just......kidding. 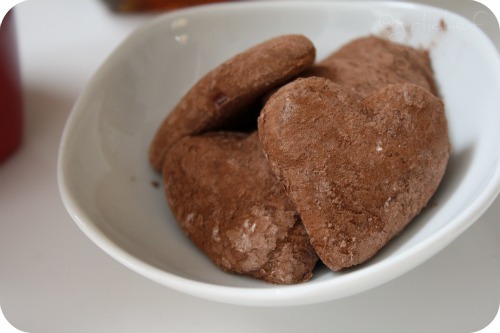 They are just homemade heart-shaped chocolate marshmallows! Spray a 9" x 9" baking pan, line bottom and sides with parchment paper, and spray paper. Combine sugar, syrup, honey, and ½ cup water in a 2-qt. saucepan over medium-high heat. Bring to a simmer; cook, without stirring, until syrup reaches 250° on a candy thermometer. Remove from heat; let cool to 220°. Meanwhile, bring some water to a boil in a small saucepan. Place bowl of gelatin dissolved in water over boiling water without touching the bowl to the water; whisk until gelatin becomes liquid. Transfer to the bowl of a stand mixer fitted with a whisk; add ½ cup cocoa powder. Add the slightly cooled sugar syrup to gelatin; whisk on high speed until mixture holds stiff peaks, ~5–6 minutes. Pour mixture into prepared pan; smooth top with a rubber spatula that has been sprayed, as well. Let cool until set, ~6 hours. Combine remaining cocoa powder and cornstarch in a bowl and transfer to a strainer; dust work surface with mixture. Slide a knife around edge of pan to release marshmallows; remove from pan. Dust cocoa mixture over top. 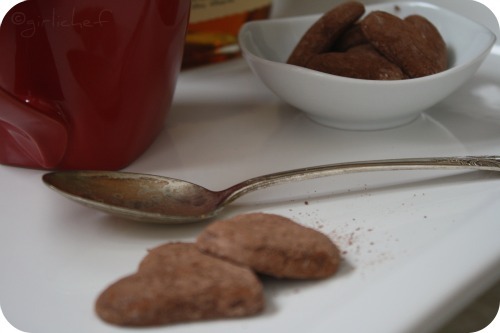 Dip a small heart-shaped cutter into the cocoa mixture and cut out individual hearts. (alternately, use a slicing knife dusted with cocoa mixture, and cut marshmallows into small squares or rectangles for "regular" mini-marshmallows). 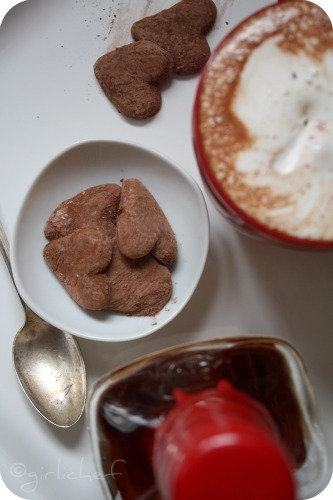 Toss marshmallows with remaining cocoa mixture. Once you have your marshmallows all laid out in front of you...beware of the call for hot chocolate that will echo through the room. MmmHmm. They practically BEG for it! And since I hate to disappoint, I went ahead and made some Dark Hot Chocolate spiked with a little booze...inside and on top. Place chocolate, milk, and vanilla in a heavy-bottomed pan over low heat, whisking pretty constantly until it's all melted and combined. Pour a shot of bourbon into a waiting mug and top with hot chocolate. Place the cream and bourbon in a large bowl. Pour in a little vanilla and some sugar and whip to stiff peaks. 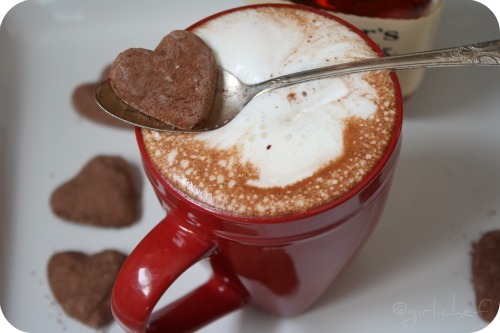 So, now you plop a big old spoonful of the Bourbon Whipped Cream onto the steaming mug of Dark Hot Chocolate...and spoon in a few Heart-Shaped Mini Chocolate Marshmallows. The marshmallows melt into the hot chocolate with the whipped cream, creating a thickened, chocolaty, boozy mug of dessert (or anytime) bliss! Also sharing with Warm Desserts event held at Mharo Rajasthan's Recipes and Melt in Your Mouth Monday at Make Ahead Meals for Busy Moms. You know, you can never really have too much photos!!! I love each and everyone of them! Que idea mas buena para tomar un buen chocolate. Never too many photos like this. These marshmallows are awesome!! I've got pack of gelatin...some honey...got it, going to give this a try!! Love the photos..I keep telling my son we need to make marshmallows..this is giving me incentive to do it.. I knew the moment I saw the small pic at DW this had to be your entry, such nice photos and lovely hearts!! Im sure no one minds the pictures, if anything, we just want more! 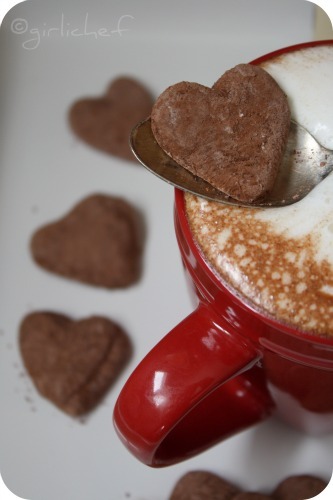 I love all the photos and I LOVE those cute little chocolate heart marshamallows! This looks like a great treat. oh my this is the coolest thing ever why not sell some on etsy I will buy them!! love this one. wish I could have some right now. I just have to have these precious little hearts. I am making them today just can't wait. Thank you for sharing this special treat! Have a great week end! with a treat like this, i don't think you could have too many pictures. that is a cuppa love right there! Marvellous clicks, seriously feel like having that cup..
Yeah Dar I think you're gonna win this one! Wow, I think I'll be forgoing all my diet rules cuz this ones worth it! 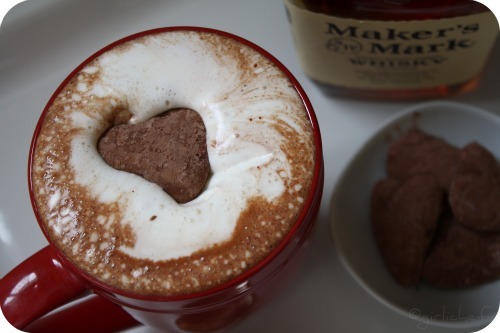 I have to try this, awesome hot chocolate with bourbon. You can incorporate as many pictures as you want when they look this damn good! I just ran 16 miles in the cold and I SO want a bowl of this. Yes. Bowl. Gorgeous! The booze in the hot chocolate isn't optional for me either. 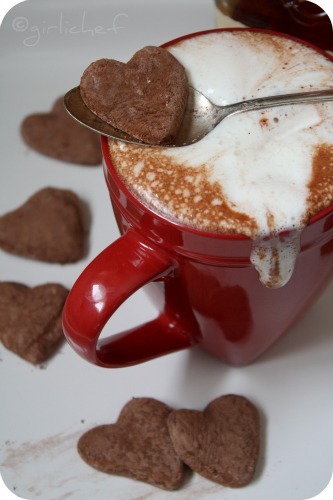 Love the bourbon spiked whipped cream and your heart shaped chocolate marshmallows are sheer perfection! Chocolate marshmallows! I have GOT to make these! I have never really had a desire to make marshmallows myself, but chocolate ones are a whole different thing... and I bet tehy make great s'mores too! Oh my gosh. I can not wrap my mind around the completel awesomeness of this!!! Oh. My. Gosh. That is just...I am speachless. I have never seen anything so magnificent. So I can see why you had a hard time choosing...all of these photographs are great, and they are making me crave marshmallows and hot chocolate badly! Thanks for sharing tonight! I hope you have a restful Sunday full of love and laughter! So very decadent, love the sound of bourbon whipped cream here! All the pictures look great. You really captured the deliciousness of your creation! 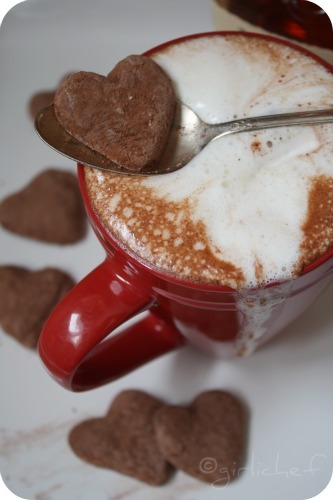 Hm...hot chocolate and chocolate marshmellow are so perfect for this cold winter! BTW, thanks for stopping by my blog and leaving a sweet comment. Hope to see you back real soon. Wow amazing and so delicious looking. 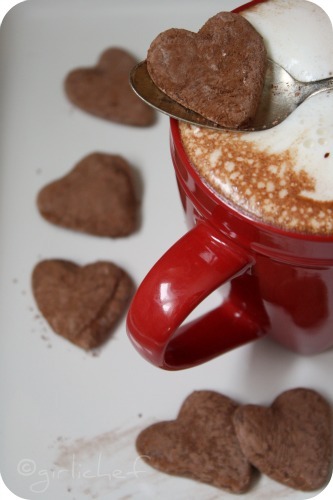 Please feel free to send your hot chocolate to my "Celebrate Sweets - Warm Desserts" event. Chocolate in chocolate topped with booze. What's not to like here! DAMN! I will come dig you out of the snow for this treat! My goodness woman! Make this for me! You just won me over. May it never be summer so I can sip on whiskey and chocolate and wear big warm clothes. SOLD! Nice work. I also like the new header, looks clean. I love them! They are so freaking cute. ☺ I haven't made mallows yet - better put them on the list! when i saw your fair warning in my dashboard, i had to click on your posts right away. im glad i did loved it.. and if only i could have a cup of these chocolate goodness before i sleep.. because im afraid i might dream about them tonight haha. What a heavenly treat Heather! Homemade marshmallow are the best and I love your spiked cocoa. Thanks for sending it to Dessert Wars! Looks awesome and delectable.. Lovely..